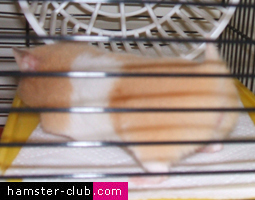 Thus the saying "hamster lordosis" meaning that the female hamster is in oestrus and ready to mate. (see hamster images on the left). The female hamster will remain stiff and 'freeze', staying with her tail up for minutes! The hamster's oestrus cycle comes in 4 stages: Hamster Proestrus, Oestrus, Metoestrus, Dioestrus. We will not go into further detail so that we do not complicate things to make you understand how each stage works, but basically when the hamster is in estrus (usually every 4 days), this always means that the female hamster will accept the male hamster to mate. Obviously we do not recommend mating hamsters since it is so much better to adopt, but this kind of information is good for all hamster lovers to know.